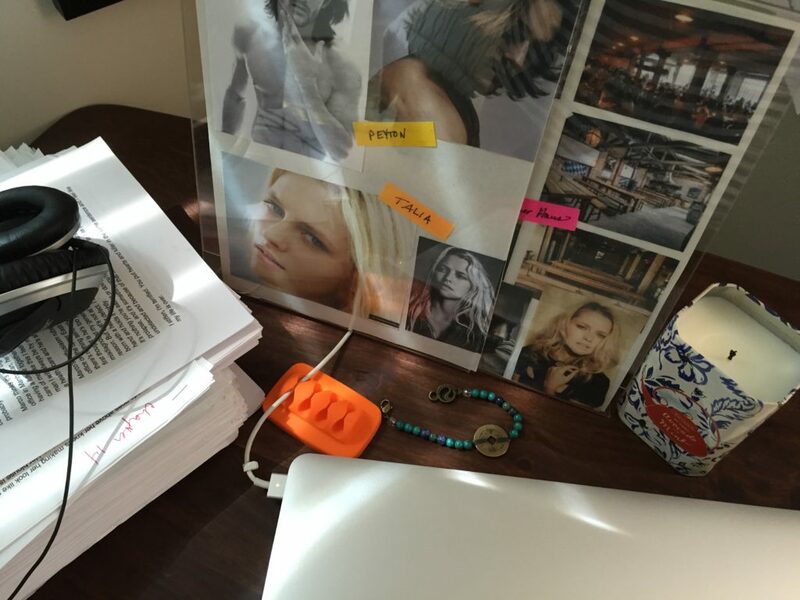 My desk, FLAWLESS manuscript and pretty pictures. Today I’m battling with the hero and heroine (Peyton & Talia) in my upcoming book, FLAWLESS. This is a photo of what my desk looks like. I have small vision boards of my characters and locations for inspiration. When the writing is going smoothly, I rarely glance at the images, but when a scene isn’t working the way I want, I stare hard at the vision boards until authentic dialogue or narrative comes through. Today’s issue is with a scene I’ve re-written a few times, a scene that is very personal because it comes from my own life. Here’s my rule of thumb when I use material from my life and put it in my books: if it’s a traumatic experience, my characters’ reactions and responses have to be authentic even at the risk of losing credibility with the reader, temporarily, because my heroes and heroines must be flawed, like me, like real life people. BUT, and this is a big but, my characters must also show humor because I’m not writing the next War and Peace, I’m writing romance that needs a happily ever after. In my life, humor has gotten me, and my family, through some of the worst events—things we never expected to happen to our family. Laughter is essential for me, so humor is essential for my characters. It is not meant to minimize the seriousness of a personal crisis; it makes it bearable. So that’s why I have vision boards on my desk. You’ll also notice, aside from my Mac and my headphones, there’s a “Health” bracelet from Energy Muse. I don’t really believe in magic talismans, but I wear this bracelet because the pretty turquoise and jasper, and the Chinese coin, remind me to take care of myself. It works as a prompt so I leave my desk and go to the gym, or I walk to the kitchen and chug some good clean water, or I drop what I’m doing and spend a half hour on my yoga mat stretching my body and clearing my head. And then there’s the stack of paper. Over 500 pages! Oy. That’s the printed copy of my WIP (work in progress). I like to print out my manuscripts and read through them slowly, marking them up with different colored pens based on the type of revisions they need. This is where the Avocado & Mint candle from Anthropologie comes in handy. I use it to burn my WIP. Kidding. The candle is just for ambience, especially when I get tired of looking at a wall or the piles of dirty laundry at my feet while I’m writing. Winner: On another note, I want to mention the winner from the blog giveaway. Vera Lloyd won the signed books! Status of FLAWLESS: That stack of paper on my desk—yeah, that’s FLAWLESS, and I’m still in the revision stage. It’s very boring to hear me talk about my revisions, so I’m not going to. I’m well aware it’s annoying to readers that I don’t provide publication dates months in advance. I apologize, however, I think I’m sparing you more aggravation. Sara on social media: I’ve been posting less on Facebook and rarely on Twitter because I’m trying to spend more time living in the present, face to face with people. However, if you PM me on Facebook or send me an email, I do respond. I check social media every single day for personal messages because I want to stay in touch with all of my readers. What’s next? I’m going on vacation and I’m taking that giant stack of papers with me so I can continue to polish FLAWLESS. I’m going to keep writing, you keep reading! I couldn’t agree with what you said about sticking to keeping it authentic when taking an event from your personal life. I also wholeheartedly agree that humor/laughter is the best medicine for those rough awful patches. I can say that your books have an excellent balance of real life drama, romance, traumas and life experiences that are rounded out with the best dose of humor. I appreciate the time you are taking to make this book the best it can be.